The World Health Organization released a statement this afternoon, prompted by news of the NDM-1 multi-resistance gene. 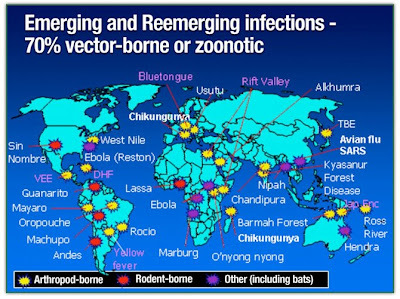 It’s worth taking a look: The agency recommends that countries around the world pay serious attention to the emergence of this resistance factor. The WHO has been working on antibiotic resistance for a while now, though the effort seems to be continually obscured by urgent news of outbreaks such as SARS, H5N1, H1N1 and so on. Here’s their short fact sheet, detailed program page, and Global Strategy for Containment of Antibiotic Resistance (sadly 9 years old, so it predates the emergence of community MRSA, not to mention NDM-1). I have a story tonight at CIDRAP about a paper published this evening in the journal Science. To respect fair use and make sure my colleagues get clicks, I just quote the story here — but then I want to talk about why I think it’s such an important study. A multi-national team of researchers has applied a new genomic tool to a 50-year-old bacterial foe, using minute mutations to track the spread of drug-resistant staph both across continents and within a single hospital. In a briefing yesterday for the press, the authors emphasized the latter finding, pointing out that the traditional infection control measures usually applied to hospital outbreaks would not curb the spread of infections that were carried in undetected from outside. Their method, they said, provides a proof of concept for using cutting-edge genomics to uncover the precise pathways by which MRSA spreads within hospitals—not only tracing its path from patient to patient, but also identifying the bug in patients whose undetected bacterial carriage could spark outbreaks but have not yet. If you’d like more, here’s a very good story at Scientific American, one at BBC Health and one by the Associated Press; and Science Daily‘s version. Now, the details. This team (which has 15 members from almost as many institutions) secured two collections of MRSA isolates: 43 collected from all over the globe between 1982 and 2003, and 20 from a single hospital in Thailand, collected between October 2006 and November 2007. All of the isolates were ST239, which is a hospital-acquired strain that is particularly prevalent in Asia. They analyzed them using high-throughput sequencing, with a particular analyzer (Illumina) that could produce whole genomes of up to 96 isolates very quickly (an extraordinary advance from the weeks and months it used to take to achieve a single whole genome). Then they compared the genomes, looking for single-letter changes in the genetic code (single-nucleotide polymorphisms, SNPs or “snips,” and also insertions and deletions of nucleotides). They used those findings to construct a “family tree” of 239 that tracks very nicely with the known history of MRSA’s emergence and initial spread, and that pinpoints rare but intriguing importations of clones from certain areas into other parts of the world. But it’s what they found in the Thai hospital isolates that is especially interesting. (Most of this is not explicit in the paper, but was related in the press briefing that Science conducted on Wednesday). The differences that can be seen in the whole-genome analysis can’t be discerned by earlier identification methods, so the isolates collected at the hospital appeared to be the same. However, they weren’t the same. Some of them were very closely related, and formed what seems to have been a chain of person-to-person transmission — a true hospital-acquired outbreak. But others of them were not so closely related, either to the outbreak or to each other. What they were, instead, were individual importations into the hospital of a hospital strain that had been acquired outside the hospital, and were carried in by staff, patients, visitors. …”That implies you have to have a different perspective on where you are going to apply your infection-control procedures and strategies,” co-author Dr. Sharon Peacock of the University of Cambridge said during the briefing. What that sounds like — and the authors acknowledged as much — is an argument for active detection and isolation/active surveillance and testing/search and destroy, the process of screening some percentage of patients coming into a hospital for MRSA carriage so that the bug can be detected and dealt with long before its presence triggers an outbreak. It is probably not a coincidence that the majority of the authors (including Peacock) are British, and search and destroy has recently become widely accepted in the UK; in fact, the National Health Service recently made it mandatory. But search and destroy remains remarkably controversial here in the US, despite strong proof of concept demonstrations in healthcare institutions such as Evanston-Northwestern Healthcare, and adoption throughout the VA system. I’ll be interested to see whether this paper makes a dent in the overall resistance to search and destroy, and if not, to hear why not. Drawing your attention: I have a story up tonight at CIDRAP on a new paper by Dr. Jan Kluytmans, a Dutch physician and microbiologist and one of the lead researchers tracking “pig MRSA,” ST398. (All past stories on ST398 here.) It’s a review paper, which is to say that it summarizes key existing findings rather than presenting original research. Still, it’s important reading because Kluytmans is one of the few scientists who have some history with this bug and understand how quickly and unpredictably it has spread across borders and oceans, from pigs to other livestock, to pig farmers and veterinarians, into health care workers and hospital patients who have no known livestock contact, and now into retail meat in Europe, Canada and the United States. Take-away: A plea and warning for better surveillance, so that we can track not only the bug’s vast range, but also its evolution as it moves into new ecological niches — including humans who are buying that retail meat and possibly becoming colonized with it as they prep it for cooking in their home kitchens. The cite is: Kluytmans JAJW. Methicillin-resistant Staphylococcus aureus in food products: cause for concern or case for complacency? Clin Microbiol Infect 2010 Jan;16(1):11-5. The abstract is here. A study published Tuesday in Emerging Infectious Diseases makes me happy, despite its grim import, because it confirms something that I will say in SUPERBUG: Community MRSA strains are moving into hospitals, blurring the lines between the two epidemics. Between 1999 and 2006, the percentage of staph isolates from outpatient settings that were MRSA almost doubled, increasing 10% every year and ending up at 52.9%. Among inpatients, the increase was 25%, from 46.7% to 58.5%. Among outpatients, the proportion of MRSA isolates that were CA-MRSA increased 7-fold, going from 3.6% of all MRSA to 28.2%. Among inpatients, CA-MRSA also increased 7-fold, going from 3.3% of MRSA isolates to 19.8%. Over those 7 years, HA-MRSA did not significantly decrease, indicating that CA-MRSA infections are not replacing HA-MRSA, but adding to the overall epidemic. So what does this mean? There are a number of significant aspects — let’s say, bad news, good news, bad news. Bad: CA-MRSA strains are entering hospitals in an undetected manner. That could simply be because patients entering the hospital are colonized by the bug and carry it with them. But it could also be because healthcare staff who move back and forth between outpatient and in-patient settings — say, an ambulatory surgical center and a med-surg ward — could be carrying the bug with them as well. Good: If they are detected (analyzed genotypically or for drug sensitivity), CA-MRSA strains are less expensive to treat because they are resistant to fewer drugs, and some of the drugs to which they are susceptible are older generics, meaning that they are cheaper. Very Bad: The entrance of CA-MRSA strains into hospitals risks the trading of resistance factors and genetic determinants of transmissibility and colonization aptitude in a setting where bacteria are under great selective pressure. Several research teams have already seen this: In several parts of the country, CA-MRSA strains have become resistant to multiple drug families. Is there a response? The work of Extending the Cure focuses on developing incentives that will drive changes in behavior around antibiotic use. These results, lead author Eili Klein told me, call for developing incentives for creating rapid diagnostic tests that will identify not just that a bug is MRSA, but what strain it is, so that it can be treated appropriately and not overtreated. The results also underline the need for something that is particularly important to me: enhanced, appropriately funded surveillance that will define the true size of the MRSA epidemic and delineate the behavior of the various strains within it. Right now, surveillance is patchy and incomplete, done partially by various CDC initiatives and partially by the major MRSA research teams at academic medical centers. As we’ve discussed, there is no national requirement for surveillance of patients, and very few state requirements; there is no incentive for insurance companies to pay for surveillance, since it benefits public health, not the patient whose treatment the insurance is paying for; and there is a strong disincentive for hospitals to disclose surveillance results, because they will be tarred as dirty or problematic. Yet to know what to do about the MRSA epidemic, we first have to know the size and character of what we are dealing with, and we do not now. Constant readers, you probably know that yesterday the World Health Organization declared the first flu pandemic in 41 years. I want to point out for you a side issue in the H1N1 story that has great relevance for MRSA, especially ST398. This is important for our purposes because we know that we are in the same situation with MRSA ST398: The strain was first spotted in France, and has been a particular research project in the Netherlands, but has been found pretty much wherever researchers have looked for it, throughout the European Union, in Canada, and most recently in the United States. All told, though, the scientists concerned with it are still a small community; there is no broad surveillance looking for this bug. To understand the need to look at animal health in order to forecast threats to human health, you can’t do better than the map I’ve inserted above (because Blogger, annoyingly, won’t let me put it below). It has appeared in various forms in various publications for about 10 years but originates I think from the IOM’s Emerging and Reemerging Diseases report in the early 90s. (This iteration comes from the One Health Initiative website.) It depicts the movement of new diseases from animals to humans over about 30 years. It’s up-to-date through SARS and through the 2003-05 movement of H5N1 avian flu around the world. I’m sure H1N1 will be added soon. How many of those outbreaks could we have shortcircuited if we had been warned of their threat in good time? Bad news from the Association of Professionals in Infection Control and Epidemiology (APIC): In a survey of almost 2,000 of their 12,000 members, 41% say that their hospitals’ infection-prevention budgets have been cut due to the down economy. Three-quarters of those whose budgets were cut experienced decreases for the necessary education that trains healthcare personnel in preventing the transmission of healthcare-associated infections (HAIs) such as MRSA and C. difficile. Half saw reductions in overall budgets for infection prevention, including money for technology, staff, education, products, equipment and updated resources. Nearly 40 percent had layoffs or reduced hours, and a third experienced hiring freezes. A third of survey respondents say that cuts in staffing and resources have reduced their capacity to focus on infection prevention activities. A quarter of respondents have had to reduce surveillance activities to detect, track and monitor HAIs. Constant readers, you will no doubt have seen the overnight news about a paper by CDC authors in the Journal of the American Medical Association, reporting a significant decline in catheter-associated bloodstream infections (known by the uncatchy acronym CLABSIs, and yes, people pronounce it “klab-seez”) in intensive care units. Our results show that the 6 most common adult ICU types reporting central line–associated BSIs to the CDC, which together account for 96% of all reported MRSA central line–associated BSIs among studied ICU types, have experienced declines of 50% or more in the incidence of MRSA central line–associated BSI since 2001. This means that the risk of primary MRSA bloodstream infections among patients with central lines in these ICUs has substantially decreased in recent years. First, let’s stipulate that any reduction in healthcare-associated infections is good, good news. Having said that, let’s drill down into the paper a bit. Because in some of the coverage last night and this morning, this paper is being represented as “Hooray, the MRSA problem is over,” and that’s an over-reaction. Here are some reasons why. The data come from several overlapping CDC databases: the National Nosocomial Infections Surveillance system (NNIS) and the National Healthcare Safety Network (NHSN). The NNIS existed from 1970 to 2004; there was a data gap in 2005, and the NHSN sprang up in 2006. There were 300 hospitals in 37 states reporting to the NNIS when it shut down, and in 2007 there were 518 reporting to the NHSN, many of which joined that year as a result of new mandatory HAI reporting in New York, Colorado and South Carolina. Participation in either database was/is voluntary. The CDC analysis abstracts data from the reports to those systems for the years 1997-2007. But, as you can guess from those numbers above, the data does not cover all 7,500 US hospitals; and because it is more weighted to certain states, it does not represent a nationally representative sample. In addition, hospitals came into the system(s) during the study, and also dropped out; an accompanying editorial estimates that only 6% of the 599 hospitals in the study reported data for all 11 years. Second, it’s important to note that all CLABSIs went down: MRSA infections, drug-sensitive staph (MSSA) and other organisms. So something is going on — but it is not MRSA-specific. Optimistic interpretation: Enhanced infection control in hospitals is suppressing all HAIs. Pessimistic interpretation: Enhanced scrutiny, in the states that account for the most additional hospitals, is negatively affecting HAI reporting. Can we distinguish which? Probably not. On the one hand, CLABSIs started trending down in 2001, before the earliest mandatory reporting legislation became effective. On the other hand, the study doesn’t/can’t associate declines in CLABSIs with any specific interventions — so it is not possible to know from this study whether one particular strategy was responsible for this decline. Third, to put the study focus in context, MRSA accounts for only about 7% of CLABSIs; according to the paper, it is not those infections’ most common causative organism. And CLABSIs do not account for the largest proportion of MRSA HAIs; according to a 2007 paper, they fall third on the list behind nosocomial pneumonia and septicemia. Fourth, since it is abstracted from a hospitals data base, this study doesn’t address community MRSA infections — and there are some scientists in the family of MRSA researchers who would insist that it is the increasing prevalence of community infection that is the true driver of the MRSA epidemic. So: Decreased MRSA HAIs, good news. Reasons, unfortunately unclear. Significance, possibly less than the headlines this morning maintain. But whatever it is that those hospitals were doing, let us hope they keep doing it. The cite is: Burton, DC, Edwards, JR, Horan, TC et al. Methicillin-resistant Staphylococcus aureus Central Line-Associated Bloodstream Infections in US Intensive Care Units, 1997-2007. JAMA. 2009. 301(7): 727-36. The accompanying editorial is: Climo, MW. Decreasing MRSA Infections: An End Met by Unclear Means. JAMA. 2009. 301(7)772-3. If you follow hospital-acquired infections, you know there’s enormous debate nationally over the best strategies to use: “search and destroy” versus targeted surveillance; guidelines from SHEA, APIC, CDC, or elsewhere. The competing assertions and the lack of clarity can be dizzying. Here’s news though of one local area that has decided to cut through the fog. A private healthcare organization, state universities and a state hospital association have teamed together to create the South Carolina Healthcare Quality Trust, a partnership that says it will test evidence-based best practices and use IT tools to rapidly distribute them to the 60+ smaller hospitals in the state. There’s not a lot of detail up yet about what the trust plans, so let’s applaud the effort while reserving judgment until we see what strategies they choose to test and why. Meanwhile, though, here is the announcement from Health Sciences South Carolina, which is a collaborative of several universities, and a FAQ; a story from the national publication Modern Healthcare; and one from the state newspaper, the Columbia State. The Seattle Times this morning launched an three-day investigative project on incidence of HA-MRSA in Washington State that is worth reading. I am puzzled by one thing I am seeing on the story’s web page — one of the items in the break-out box that sums the story up very quickly to attract eyeballs to it. It says: “About 85 percent of people infected with MRSA get the germ at a hospital or other health-care facility. ” That figure doesn’t make sense to me; it sounds as though it is a mis-translation of the CDC finding a year ago (in the Klevens JAMA paper) that approximately 85% of invasive cases of MRSA have hospital-associated risk factors. Constant readers will remember that estimate has been challenged by researchers on community MRSA, who believe that CA-MRSA accounts for a much larger proportion of the current epidemic than has been acknowledged, and think that the wide spread of the community strain is the actual driver of the overall epidemic. I can’t see where in the text the Times team has done the math to support that assertion, so if anyone else spots it, or knows the reference it comes from, please let me know. There’s a ton of new, and conflicting, findings on prevention and detection of hospital-acquired MRSA and other infections. First: Today, in the journal Infection Control and Hospital Epidemiology, three researchers from Virginia Commonwealth University add to the ferocious debate on “search and destroy,” the colloquial name for active surveillance and testing: that is, checking admitted patients for MRSA, isolating them until you have a result, and and if they are positive, treating them while continuing to isolate them until they are clear. “Search and destroy” has kept in-hospital MRSA rates very low in Europe, and has proven successful in some hospitals in the United States; in addition, four states (Pennsylvania, Illinois, California and New Jersey) have mandated it for some admitted patients at least. Nevertheless, it remains a controversial tactic, with a variety of arguments levelled against it, many of them based on cost-benefit. This report is an important bookend to an earlier GAO report from last April that explored the poor state of MRSA surveillance nationwide. Read it if you wonder why we don’t really know how much MRSA – in hospitals or in the community – we have.